Russian cyber intelligence officers tried to hack the UK's Foreign Office, a British diplomat has said. Peter Wilson, the UK ambassador in The Hague, said Russian intelligence officers tried to compromise Foreign Office systems with an attack in March. 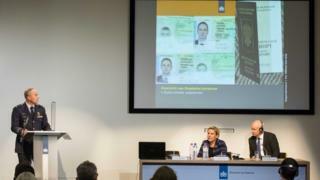 The accusation comes after Dutch security services said they expelled four Russians over a cyber plot against the global chemical weapons watchdog. Moscow said the allegations were "not backed by any proof". Elsewhere, the US has charged seven Russians with hacking anti-doping agencies and other organisations. The allegations are part of an organised push-back against alleged Russian cyber attacks around the world. Foreign Secretary Jeremy Hunt said the UK was discussing further sanctions against Russia with its allies. He said Russia's "fake news" was in contrast to "the hard evidence of Russian military activity" provided by the joint operations between the Dutch and British governments. Meanwhile, Labour's deputy leader Tom Watson has written to Mr Hunt calling for an inquiry into alleged Russian interference in UK elections - in particular the EU referendum. In his letter he accused the government of "ignoring glaring concerns" and said there had been no response to a parliamentary committee that had asked whether the intelligence services were investigating. In a statement with Dutch Prime Minister Mark Rutte, Theresa May said "joint operations" had shone "further light on the unacceptable cyber activities of the Russian military intelligence service, the GRU". Mrs May said the attempted hack of the Organisation for the Prohibition of Chemical Weapons (OPCW) demonstrated the GRU's "disregard for the global values". The watchdog, based in the Hague, was examining the 4 March Salisbury attack. Mr Wilson said targeting of the OPCW headquarters in May followed unsuccessful attacks by the GRU on the Foreign Office in March and on the defence laboratories at Porton Down, which was also investigating the Salisbury poisoning, in April. Labour leader Jeremy Corbyn said Russia needed to be confronted with the evidence and that this had to be a "diplomatic confrontation". "What I want is positive relations with Russia but that does mean diplomatically confronting them with the evidence both of what happened in Salisbury and of course the more recent cyber issues that come up," he said. Today's astonishing revelations show how much the UK and its allies are prepared to co-operate to maintain pressure on Russia. The British government could have sat back after it persuaded 28 countries to expel more than 150 Russian diplomats and intelligence agents in the wake of the Salisbury attack. 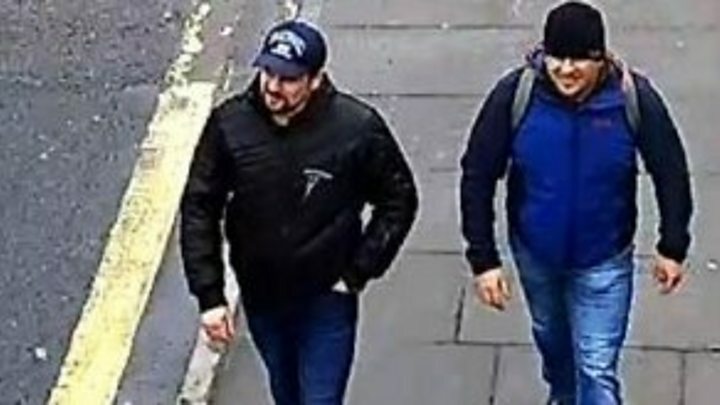 But it went further, revealing the identities and pictures of the two Russia spies it believes were responsible for poisoning the Skripals. And now the UK and the Dutch governments have revealed a huge amount of new intelligence about how the GRU has been operating across the world. The aim of this highly unusual openness is to counter Russian behaviour by exposing their operations to the world. But for the British, there is also a wider message: namely that the UK will continue to co-operate with its European partners in the fight against Russian aggression. Earlier, the UK government accused the GRU of being behind four high-profile cyber-attacks whose targets included firms in Russia and Ukraine; the US Democratic Party; and a small TV network in the UK. Russia has called the accusations a "diabolical cocktail" of allegations as well as a "rich fantasy of our colleagues from Britain". A statement from Nato called on Russia to halt its "reckless pattern of behaviour, including the use of force against its neighbours". Nato also said it would "strengthen its defence and deterrence to deal with hybrid threats". Video What is the GRU?